Michael Johnson was a pleasure to deal with. He sold me my dream corvette and made the purchase easy and hassle free. The owner is a great guy as well. He was up there on Saturday pressure washing the building by himself. Was impressive seeing the owner out sweating while his employees were in the air conditioning. Tells me a lot about his work ethics and what he expects from his employees. He even took the time to tell me about my Vette in detail. Seemed like a great guy. They were all great. this is an epic car, the most beautiful car on the face of the earth.it has such an excellent performance and is purely an englishman which tells us about its character and quality let alone the safety.0_60 is app. 4 seconds.One with convertible roof is also available. it is really really expensive but worth every penny you pay! When I drove the car, it was smooth and fast, and safe if you use it responsibly. Excellent dealership, highly recommend. Purchased a pre-owned vehicle. Have been here twice. Look forward to working with them again in the future. Thank you again. I highly recommend anyone who needs a car to buy this DB11. It is a great vehicle for anybody. I myself, Mr. KeatDaddy, love this car to death. i had made an inquiry on an escalade, the salesman called to check if i were still interested on the one. I advised that i already made a deal on one. he very politely said thanks if we ever back in the market to let him know. Very helpful, worked hard to find exactly what I was looking for. Unfortunately, the vehicle we fell in love with was out of our budget. Greatest Luxury Car Buying Experience Ever! I recently purchased a Pre-Owned Aston Martin and the process was very easy. i was able to do everything for the most part by phone. When I showed up to the dealership it was just as easy as the Sales Mgr Chris told me it would be. However I was blown away at the cleanliness of such a beautiful facility. When I took delivery of my vehicle it was perfect. Thank You Aston Martin for being here to help me with my dream purchase! Cory of Dallas TX. Top-notch dealership! Their team always goes above and beyond to deliver world-class customer service. I love doing business with them, and would highly recommend them for both sales and service. What an unbelievable experience! After buying from Chris and team, I felt compelled to tell everyone about the exceptional experience I had at Aston Martin of Dallas. I arrived late on a Saturday to look at a car expecting everyone to be gone for the night or for the weekend. To my surprise, Chris Johnson, the GM was there at 5 after close and welcomed me in with open arms. My wife and I spent over an hour with him as he explained the differences in the vehicles, options and above all made her feel welcome. We left that night considering the vehicle they had and another vehicle elsewhere. When it came down to making the decision to purchase, it was Chris' attention to detail and his ability to connect with us that made the difference. Once we returned on Monday, we learned the true depth of the experience at the dealership and the quality of the facility, the team and the vehicles. We left with a remarkable car at a great price and above all -- a remarkable experience. I could go on but if you're considering an Aston Martin, you've got to experience it for yourself. I highly recommend Aston Martin of Dallas to anyone near or far. They say it's the car but it's actually the people and their character that make the difference. Bravo! Great customer service! Highly recommend! New showroom is awesome with a great selection and a true no pressure sales process. I got my dream truck from Tony and his team! Great performance car, terrific styling, simply lovely. Driving the car was exhilarating and the engine sounds were exciting! The entire staff is great. Friendliest dealership I have ever bought a car from. Even though I haven't needed service yet, looking forward to taking advantage of the benefits they offer as part of the Owners Club program. Great job, Aston Martin of Dallas! This is our second Aston Volante and it's a stunning car. The interior and exterior styling is just gorgeous. Where ever we go people are taking pictures and giving us compliments. Overall craftsmanship is over the top - and the car has that great leather smell when you open the doors. Performance is more than anyone will ever use. Oh, and that Aston sound when you start the car and when you get on the gas. You will always have a smile on your face. Both cars have been very reliable and easy to maintain. If you are looking for a sports GT at this price point, put it on your test drive list - you won't be disappointed. Bring one, Bring all. I will come back here for my next car and I will tell all my friends and family to check out this place. I've owned this car for over a month and it runs great at start up. 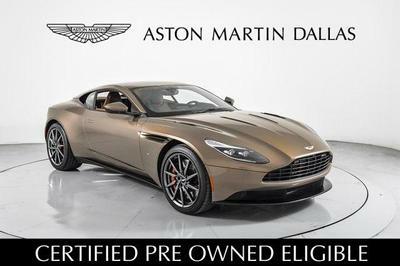 My last car was a 1988 Toyota Camry, but this Aston takes the cake. I worked for exactly 6 years, 510 months, 45 days and 2700 hours in counting to be able to afford this beast. Unfortunately gas is so high that I can only start it up and watch it run in my garage. Nevertheless I have a promotion coming up and should be able to put this hot momma on the road! I like this car - it is great for highway driving, taking the wife etc. to dinner and trips from WPB - to Naples. However I found the long wheelbase an issue for handling on tighter mountain roads. I shipped it to Maine last summer and it was not great. Prefer my Audi R8GT for better handling. Ride not as smooth but much tighter on the road. Palomino Motors is staffed with knowledgeable, friendly, and honest people. None of the usual sales games. I would recommend them to friends, and we&apos;ll be back when we are in the market for another vehicle. The best! Rapide has a sofisticated design, much in line with DB9 and DBS. The fact that is longer and wider makes it much more elegant. The engine is quite smoth as well as nervous depending on what driving experience we want to have. I love driving it and share this experience with my friends...great car!!! Long Distance Purchase worked out just fine! I found a very specific and unique sportscar at TVE using the internet (Jaguar XK-R). I&apos;m in Illinois so giving it a test drive in person was not practical. I sent a friend from the Dallas area to inspect the car and test drive. Everything went without a hitch. The inspection showed no surprises. The dealer didn&apos;t point out anything, but any blemishes were there to see and the dealer certainly didn&apos;t try to hide anything. The test drive went good, everything on the car checked out. The carfax was good and I called Jaguar and the VIN check showed all maintenance was up to date. I bought the car without a hassle ($500 deposit, cashier&apos;s check down payment with paperwork, they financed balance of car price at a better than local rate). Everything went as fast as you could hope for thanks to a prepaid and labeled Fedex envelope. They received my check on Friday morning, car was loaded on a transporter on Saturday morning, I received the car Sunday night. Car had all the minor issues I already knew about, nothing more. Engine runs perfectly, even better than expected. I&apos;m extremely pleased and would not hesitate to buy from this place again. There are some other places near the area I would NOT recommend - but this place is A-OK! They&apos;ve been in business around 17 years. You don&apos;t stick around that long if you sell junk. I will certainly check them out again when I&apos;m looking for that special sports, luxury, or off-road vehicle!